What’s New in the Mill and on the Farm? We use Instagram – have a looksee. Happy – New – Decade ! This year we had a white – day after Christmas – and the day after that, and the day after that. Drifts as deep as 4 feet side by side with bare ground. The wind blew and the turbine turned producing record amounts of power. A good thing. The snow never seems to bother our maremmas. In fact they LOVE snow …..
Wishing everyone a great new year ! The puppies are growing by leaps and bounds. As of a week ago we have assigned a few puppies to groups of goats and/or sheep for them to work with regarding their livestock guardian puppy skills. Even at this age they position themselves BETWEEN the livestock and the “intruder” ( who in this case is the person taking the photo ). They are not behind the animals but in front. Folks always ask us if we need to train the puppies to guard. The answer is plain to see here – they will position themselves and guard instinctively despite their current small size. What needs to be learned is interspecies socialization — how to interact with people, how they are to behave around the animals they are guarding. Puppies LOVE to play and it is difficult for them to understand that the sheep and goats do not want to play along. We have found it beneficial to have a couple of puppies together in one pasture. They play with each other and do not try to get the livestock to participate. The real trick is to intervene immediately when negative behaviors, such as chasing, are demonstrated so those behaviors do not become routine. Regardless of “training” it is essential that a would be Maremma owner understand that these pups will not be responsible adults until somewhere between 18 and 24 months of age ! 78 Days ‘Til Spring ! 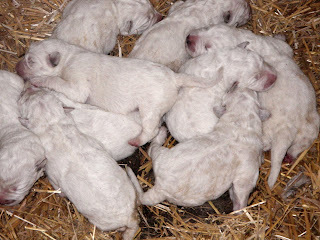 We are pleased to introduce you to our first litter of Maremmas in quite a while – about 5 years. There are 4 female and 5 male pups. This photo is from about two weeks ago prior to eyes opening – so they are all in one place. Kind of a “pile ‘o pups”. Now they are up and about keeping their mother mighty busy keeping track of them all. A picture is worth a thousand words and this one speaks volumes about the intelligence of this breed of livestock guardian. Our dogs provide us with a sense of ease about the safety of our sheep and goats. Always on duty, we can rest assured that they are on the watch. This is Laika our adult female. Sirius as a serious puppy. Now it’s 22 ! YES ! Sheep In The City – Visit Them at the Church in Manhattan!